Recipe courtesy of Kristin and Devon Potler of www.lovefeasttable.com. On medium-high heat, melt 1 tablespoon butter and add chopped onions. Caramelize onions—they should be golden brown. 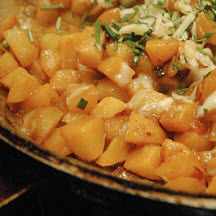 Add 1 tablespoon butter, garlic and diced potatoes. Fry the potatoes, stirring occasionally and gently scraping the bottom of the pan for 3 to 5 minutes. Add 2 tablespoon butter and let it melt. Add 1/2 cup water and bring to a boil until water is reduced to nothing. Stir occasionally. Add another 1/2 cup water and boil again until reduced completely. Stir occasionally. Add another 1/2 cup water and reduce half way. At this point, potatoes should be tender. Sprinkle in cheese, rosemary and salt and pepper to taste.